If it’s a bubbly wine from another region, it’s sparkling wine, not Champagne. Winemaking dates as far back as ancient Roman times. Following the Crusades, monastic holdings of vineyards increased significantly. Champagne wines were often served during coronations, sacrament and the consecration of treaties. But it was not until the 17th century that the “sparkle” in wine was discovered by accident. Along with engineering, it took advances in European understanding of chemistry and biology to make possible the Champagne we know today. Before the Enlightenment, even master winemakers had very little understanding of how fermentation worked. Contrary to popular belief, the Abbey of Hautvillers cellar master Dom Pérignon did not invent Champagne however, he did pioneer many practices that enhanced both the taste and quality of Champagne. English physician Christopher Merret documented the addition of sugar to a finished wine to create a second fermentation, six years before Dom Pérignon set foot in the Abbey of Hautvillers. In 1662 Merret published a paper noting that if you added sugar to wine it would continue to ferment in the bottle, yielding bubbles. More than a century later, pioneering French chemist Antoine-Laurent de Lavoisier (who named oxygen and hydrogen) showed that during fermentation sugars broke down into alcohol and carbon dioxide—the stuff of bubbles. It took Louis Pasteur, in 1860, to explain fermentation as a biological process with yeast at its center. Champagne is made mainly from three grape varieties: Pinot Noir (a red variety) Pinot Meunier (a red variety related to Pinot Noir) and Chardonnay (a white variety). In France the first sparkling Champagne was created accidentally; the pressure in the bottle led it to be called “the devil’s wine” (le vin du diable), as bottles exploded or corks popped. At the time, bubbles were considered a fault. In 1844 Adolphe Jaquesson invented the muselet to prevent the corks from blowing out. Initial versions were difficult to apply and inconvenient to remove. Riddling is the process by which Champagne bottles are turned and agitated, once every two days, in order to send sediments to the neck of the bottle. The Champagne bottle is made with thicker and heavier glass to withstand the pressure created by the wine as it carbonates during the second fermentation process. All Champagne wines must spend at least 15 months in the bottle before release. In practice, most Champagne wines are cellared for much longer: 2-3 years for non-vintage and 4-10 years for vintage Champagne. The 19th century saw an exponential growth in Champagne production, going from a regional production of 300,000 bottles a year in 1800 to 20 million bottles in 1850. Goût de Diamants, a luxury Champagne brand has created what it’s calling the most expensive bottle in the world after encrusting the logo with a 19-carat diamond worth $1.8 million. Handcrafted from 18-carat solid gold, Goût de Diamants’ Superman-style signature logo is centered by a single, flawless deep-cut white diamond weighing 19 carats, replacing the Swarovski crystal that normally inhabits the space. Experience has shown that the ideal temperature to serve Champagne is 8-10°C (47-50°F). Any colder and the Champagne will numb the taste buds. Under no circumstances chill a bottle of Champagne in the freezer; and never serve it in pre-chilled glasses (or you will lose some of the sparkle). The classic way to chill a bottle of Champagne is to place it in an ice-bucket, half filled with ice, half with water, for about 20 minutes. Cracked on the bows of ships, sprayed after Formula One victories and sipped in honor of new years and new unions, Champagne has become synonymous with celebration. Actress Marilyn Monroe took a bath in 350 bottles of Champagne. On average 28,000 bottles of Champagne are served at Wimbledon each year. In a single 750ml bottle, there are approximately 49 million bubbles. 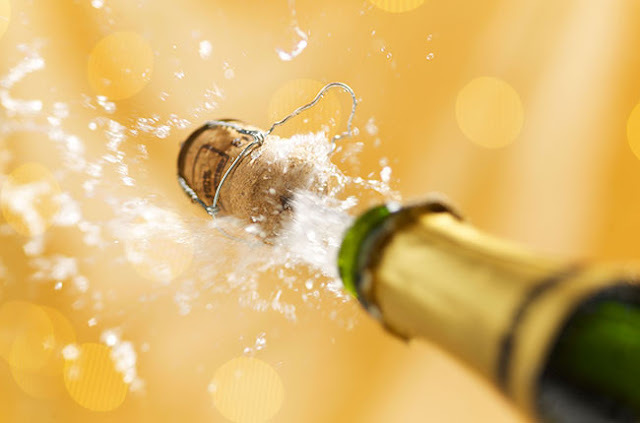 The pressure in a Champagne bottle is around 90 pounds per square inch. Even though this may not mean a lot to you, it translates into three times the amount of pressure that is in an average car tyre. Corks can fly out of a Champagne bottle at speeds near 40 km/h (25 mph) and as high as 65 km/h (40 mph). And when those corks fly, they can go far. The longest distance a Champagne cork was recorded to traverse was 54 meters (177 feet). Sabrage is a technique for opening a Champagne bottle with a saber, used for ceremonial occasions. A glass of Champagne is often the lightest choice at the bar, containing just 84 calories per 4-ounce serving. On July 4 2015, the United Nations gave the Champagne region of France world heritage status, confirming what fans have maintained all along: Champagne is unique.